How much do we connect our work with God? In a recent seminar I attended on the subject of living out our faith in all aspects of life, including work, most of the people in my small group discussion of 12 said that they never thought of their work as having anything to do with God or their faith. I always remember the response by a legal secretary in our company when she was being counseled about her poor performance in serving the attorneys assigned to her. “I don’t serve anyone but God,” she indignantly declared as she angrily reacted to her job being described as “serving” her assigned attorneys. She was obviously confused about what serving God entailed — that we serve God when we faithfully serve the people and responsibilities in our work. 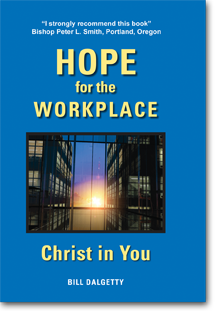 As Christians who have accepted God’s offer to dwell in us, we serve God and take care of his creation when we bring his presence into our work, seeking to bring his love, truth and excellence to our jobs and the people and circumstances of our workplaces. This entry was posted in Uncategorized on January 26, 2015 by stevedalgetty1. As parents, we have a profound duty both to instruct and to witness to the reality of God, his plan for creation, his son, Jesus Christ and the power of the Holy Spirit so that the next generation might know God, experience his presence and understand his purpose for their lives. In today’s world, many parents may no longer be experiencing God’s presence in their own lives, so it may be difficult for them to pass on much to their children. Even if parents believe in God and are practicing Christians, they often leave this instruction up to the church in the form of Catholic schools, CCD and Sunday school. While the church does indeed have a role, parents still have the primary responsibility. I know of many Christian families who do indeed fulfill this responsibility in a variety of ways — reading stories from a Children’s Bible; praying together at meals, the beginning of the day or at bedtime; establishing family traditions during Christmas and Easter, and otherwise nurturing faith and knowledge of God. Just as important is the personal example parents can provide to their children. While I never made a show of it, I never hesitated in letting my children see me in my personal prayer time as they came down stairs before breakfast. More important was for them to see my wife and me treat each other with love and respect, acknowledge our mistakes, seek forgiveness when we messed up, and let our actions generally reflect love, truth and service. While we didn’t always fulfill these objectives, we tried. Today, our children are adults with families and children of their own. We are blessed to see how they are passing on their love of the Lord and the importance they place on his presence in their lives. As grandparents, we now have the opportunity to let our words and conduct be a subtle witness to our grandchildren – even yielding to their favorite form of communication, texting. This entry was posted in Uncategorized on January 19, 2015 by stevedalgetty1. The “good news” was not just for the shepherds or just the Jewish people, but for all people. All people included the unbelieving and pagan world of the Roman and Greek cultures at the time. It included people who later became Muslim, Buddhist and Hindu. It includes the atheists of our day. Whether they know it or not, Jesus is everyone’s savior. For us, “everyone” includes the check-out clerk in the grocery store, the telephone solicitor who we hang up on, the person at work who is difficult to get along with, the person asking for money outside the metro station, the person who talks during church services or the children who can’t sit still. “Everyone” includes those who think different politically than we do and even those who wish to do us harm. As we move to the end of the Christmas season and begin a new year, we might pause to consider this message of the angel that could easily be overlooked. This entry was posted in Uncategorized on January 5, 2015 by stevedalgetty1.